From this it may be seen that the Viennese Helnwein is part of a tradition going back to the 18th century, to which Messerschmidt's grimacing sculptures are to belong, on which one of Freud's pupils wrote a long treatise. One sees, too, the common ground of these works with those of Arnulf Rainer or Nitsch, two other Viennese, who display their own bodies in the frame of reference of injury, pain, and death. And one sees how this fascination with body language goes back to the expressive gesture in the work of Egon Schiele. 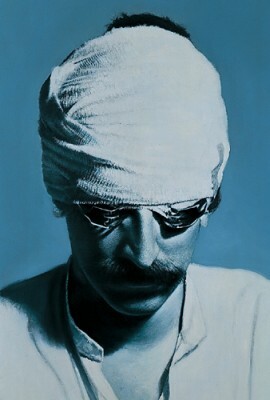 Of all of these pictures, one soon stands out: his own, in a disfiguring getup with bandaging and surgical instruments. For under this grimacing mask, with the eyes covered by operating clamps, and underneath the bandaged head the painter's face is itself put on display by this disguise. But Helnwein goes a step further: he portrays himself - not Helnwein the painter, but "Helnwein in bandages portrait," indirectly conveyed, redundant face photographed and reproduced on the side wings of large triptychs, between which a painted surface or another photograph may be seen. Or, on the other hand, he paints his icon on large canvases which are also arranged in triptychs showing variations on the original self-portrait with bandages. Here the painter in a way retouches his own portrait as painter in resorting to various fictional forms: abstract expressionism, abstraction, surrealistic transposition, etc. Just as in post "Ligeia", an "unusual tale" indeed, we are witnesses of a progressive disposition of the soul, like that of Ligeia's, who by the end of Poe's tale is nothing but a kind of empty sheath of form. The painter depicts himself in the skin of a being whose soul the surgeons have robbed of its nerve fibres. It fills us with that much more horror as he is himself no longer capable of feeling it.